Go Nominate Your Favorite EduBlogger at #eddies14! You are here: Home / EduNews / Go Nominate Your Favorite EduBlogger at #eddies14! Do you know an education blogger who you think has made a huge difference in your teaching practice, who has impacted the state of education, or who has served the interests of publication with excellence through his or her blog? 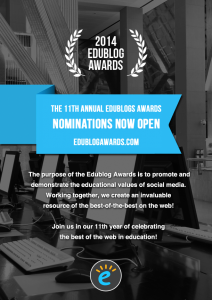 If so, head on over to the 2014 Edublog Awards where — for the ELEVENTH year — nominations are now open! The purpose of the EduBlog Awards is to promote and demonstrate the educational values of social media, according to EduBlogAwards.com. Working together, we create an invaluable resource of the best-of-the-best on the web. Nominations end at 10:59 p.m. CST on November 24; voting begins soon after that. Most influential blog post of the year: Why I Hope for Joy!